A Simply Chocolate exclusive! Knipschildt Chocolatier has created a stunning tower with the best of the best of their award winning premium chocolates. 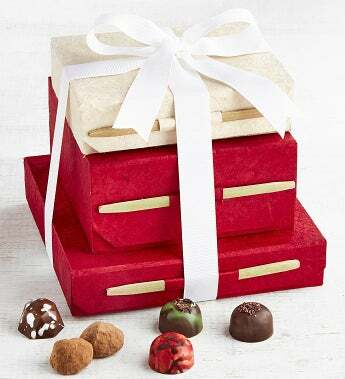 Their most sought after Signature Collection Chocolates combine with Dark Chocolate Caramel Sea Salt Bonbons and their Dark Chocolate Classic Truffles. These decadent truffles were named the 2nd best dark chocolate truffle in the world by Gourmet Magazine. Arrives handsomely tied with a sleek white woven ribbon. These amazing hand-painted premium chocolates in intriguing avant-garde flavor combinations will be sure to especially impress those who know and love fine chocolate.